Approximately 15 years ago I was working as a lab assistant in the programming department of micro assembly and object oriented languages within "College of Applied Technical Sciences" in Niš, Serbia. I was engaged with all five semesters and was teaching students from their freshman year to the graduation and every now and again, along with board of professors, I was asked to attend their final exams followed by sort of social celebration in form of small festivity with table full of food and drinks. On one such occasion, student who came from Pirot, one of the biggest cities of eastern Serbia, asked us if we ever tried before a sausage called "vitamin bomb" which, he said, was one of the oldest delicacies from the region he came from. I spotted that one of the professors, who was actually known that he tried almost everything when it came to food and drinks, started nodding his head but it was clear that the rest of us heard it for the first time. Student looked the professor and said: "I am sure this one you never tasted." and pulled out from the bag a ... well ... something that looked exactly like a "horseshoe" in both, shape and color. I glimpsed toward the professor who claimed that he tasted it before and saw that even he was surprised with strange looking sausage in student's hands. The student glimpsed the same, warmly smiled and explained to us what it is and how it's made. Today and after almost two decades later, the "vitamin bomb" sausage is recognized brand and simple translation from Serbian "Peglana Kobasica" is "Ironed" or "Flat" Sausage. Last year, town of Pirot and its tourist organization, created first "Flat Sausage Fair" and yesterday, despite poor weather, we decided to visit the second fair made in honor of this great Serbian "Soulfood" which is the mutual name for all those old recipes that survived centuries in their original forms. But, what is that so special about this sausage so it earned its own fair? The recipe is not the secret, although this is not a meal you can make in a couple of hours in your home, with a little enthusiasm it is doable and results could be extra ordinary. From what I can find online you need great selection of various quality meat (cleaned and stripped out of all fats and unwanted parts), ultra fine chopped or minced and mixed with spices (up to 2% of different chilies, 2% salt, 1% garlic, 1% pepper followed by other suitable spices according to your taste). No water or any other liquids are welcome in the mixture. Now comes the interesting part. 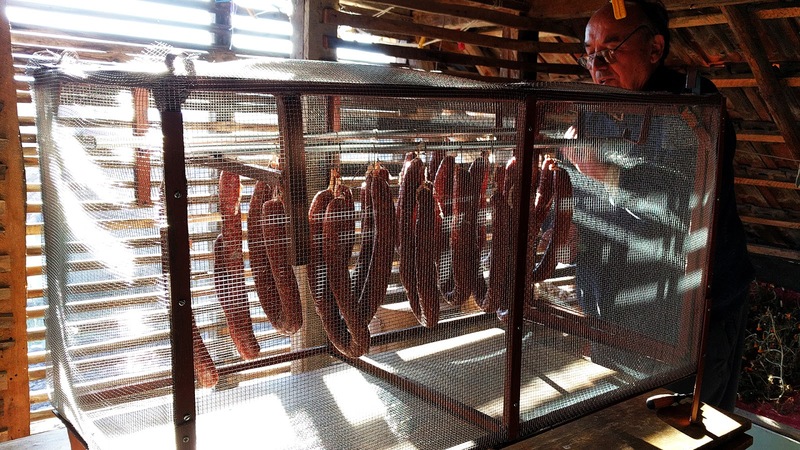 After filling is ready and wrapped into eatable natural sausage casing, sausage should be formed in the "U" shape and left for drying on the draft. The drying "chamber" must be very cold with optimal temperature around zero degree or colder, with as low humidity as possible and in presence of great frost keeping outside water from vaporizing in great scales. 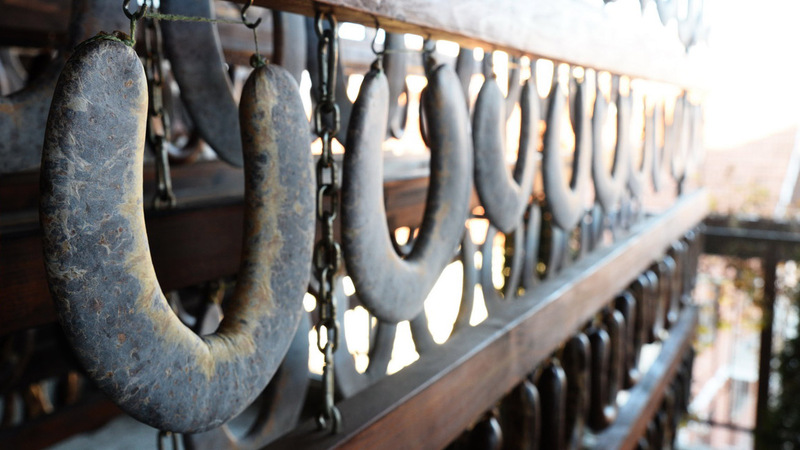 Usually with a bottle, sausages are pressed and ironed two or three times a week after which they take the form of a horseshoe. Ironing is necessary for the most of the unnecessary air and water to be ejected from the sausage which ensures longevity. Needless to say, they are purely organic with no preservation of any kind, no additives or artificial colors, no heat treatment and no exposure to smoke. Since there is no strict recipe when it comes to ingredients, it is clear that with different mixture of various meat and spices they come in wide varieties of different tastes and given the fact what are they made of and the nature of the preparation that is not changed from the times dating couple of centuries before, under my humble opinion, I have to say that I didn't try better sausage yet. And believe me, I have tried many. Even those advertised on large scales like the white sausages of Bavaria or great Danish delicacies you can buy outdoors, are simply not worthy rivals. Furthermore, energy value of the sausage is very high and it is usually served in small dosages and sliced into tiny, couple of millimeters chopped pieces. Best of all, and due the fact they contain almost no water inside, you can store them in deep freezer where they keep original taste and shape even after couple of months. Yesterday's fair was, like the year before, organized very nice and with thousands of people browsing and tasting the specimens. We bought couple of kilos of different varieties with different meat mixture and spice ratios and the winner for me was a hot whitish extra tasty brand. It was moderately hot, made out of four different kind of meat (besides beef they used best parts of goat, horse and donkey meat) and with great mixture of spices. The casings is giving this particular one whitish color which is also pretty cool and unique. Unfortunately, because of yesterday's weather and half a meter snow outside our weekend house, we couldn't get to the fair earlier and see its social side so I am including the video I made last year. Somehow and also to my taste, the jazz band playing last winter fits greatly to this particular fair and the advertising product.